Russell Hinchy currently teaches in the areas of foundations of law and torts. Prior to being admitted to practise as a barrister in 1993, Russell worked in various areas of public sector research, finance and law within the Queensland Government. Since 1994 he has taught in a variety of areas including foundations of law, contract, torts, trade practices and company law. Russell has an interest in company law and is co-author of the text Company Law (Pearson Prentice Hall, Sydney, 2nd ed, 2009). Russell is the author of The Australian Legal System: History, Institutions and Method (Thomson Reuters, Sydney, 2nd ed, 2015). Russell is also the author of Context and Method in Australian Law (Thomson Reuters, Sydney, 2019). 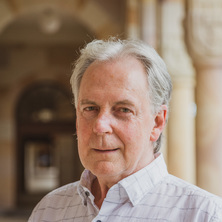 In addition to having a particular interest in teaching and learning theory, and curriculum and instructional design theory in the context of first-year legal study, Russell also has a particular interest in the developing importance and application of technology, artificial intelligence and machine learning to legal reasoning and statutory interpretation. Russell has previously held a Bar Association of Queensland Practising Certificate and is currently a Legal Practitioner of the Supreme Court of Queensland. Russell is also a Fellow of the Higher Education Academy (UK) and a Member of the International Association for Artificial Intelligence and Law. A particular interest in teaching and learning theory, and curriculum and instructional design theory in the context of first-year legal study. A particular interest in the developing importance and application of technology, artificial intelligence and machine learning to legal reasoning, case analysis and statutory interpretation. Hinchy, Russell Context and Method in Australian Law. Sydney, NSW Australia: Thomson Reuters, 2019. Hinchy, Russell The Australian Legal System: History, Institutions and Method 2nd ed. Sydney, NSW Australia: Thomson Reuters, 2015. Hinchy, Russell and McDermott, Peter Company Law 2nd ed. Frenchs Forrest, NSW, Australia: Pearson Education Australia, 2009. Russell Hinchy and Peter McDermott Company Law 2nd ed. Frenchs Forrest NSW: Pearson, 2008. Russell Hinchy and McDermott, Peter M. Fundamental Company Legislation 2008 1st ed. Frenchs Forest, NSW: Pearson Prentice Hall, 2008. Hinchy, Russell The Australian legal system: history, institutions, and method. Sydney, Austtralia: Pearson Education Australia, 2008. Hinchy, R. D. and McDermott, P. M. Fundamental Company Legislation 2007. Frenchs Forest: Pearson Prentice Hall, 2007. Russell Hinchy and Peter McDermott Fundamental Company Legislation 2007 1st ed. Frenchs Forest, NSW: Pearson Prentice Hall, 2007. Hinchy, R. D. and McDermott, P. M. Company Law. Sydney: Pearson Education Australia, 2006. Hinchy, R D and McDermott, P M Fundamental Company Legislation 2006 1st ed. Sydney: Pearson Education Australia, 2006. Hughes, Clair, Hinchy, Russell and Cappa, Clare (2007). Applying a Criterion and Standards Approach to Assessment by Examination in Law. In Geraldine O'Neill, Sylvia Huntley-Moore and Philip Race (Ed. ), Case Studies of Good Practices in Assessment of Student Learning in Higher Education (pp. 31-36) Dublin, Ireland: All Ireland Society for Higher Education. Hinchy, R D (2006) Judicial Method and Advocates' Immunity in the High Court of Australia and the House of Lords. Murdoch University Electronic Law Journal, 12 1: 187-208. Hinchy, R D (2006) Rejection of Advocates' Immunity. New Zealand Law Journal, November 369-373. Codd, B., Hinchy, R. D. and Nase, V. (2004) An alternative view of Woolcock Street Investments v CDG Pty Ltd. Torts Law Journal, 12 3: 194-201. Cappa, C. L., Forrest, C. J. S., Hinchy, R. D. and Nase, V. (2003) Tort deform or tort reform? Winding back the clock on negligence. Alternative Law Journal, 28 5: 212-215. Hughes, Clair, Hinchy, Russell and Cappa, Clare (2005). Developing Generic Criteria and Standards for Law: Processes, Practicalities and Possibilities. In: A.Brew and C.Asmar, Higher Education in a Changing World. Higher Education Research and Development Society of Australasia (HERDSA) Conference, University of Sydney, NSW, Australia, (347-347). 3-6 July, 2005. Hughes, C. P., Hinchy, R. D. and Cappa, C. L. (2004). Writing generic criteria and standards for law: What we did and what we learned. In: Gay Crebert, Lynda Davies and Susan Phillips, Supporting learning communities. Effective Teaching and Learning Conference, Griffith University, Brisbane, Australia, (not found-not found). 4-5 November, 2004.